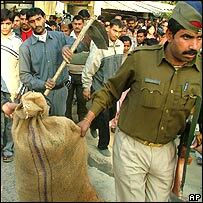 Indian police say they have found bags containing the clothes and skeletons of a number of small children near Delhi. They were discovered in Noida, some 20 km (12 miles) from the capital. A search is on for more remains. Noida's police chief, RKS Rathore, told the BBC there were at least four skeletons, possibly many more. The discovery came after a man confessed to killing six children in Noida's Nithari district after sexually abusing them. Superintendent Rathor said six children below the age of 12 had gone missing from the Nithari area in the last year. Local people say far more children are missing. Police said they initially arrested the man in connection with the murder of a young girl. They say further questioning of the man led to the discovery of the skeletons. The skeletons were found in the house of a businessman where the suspect worked as a servant. 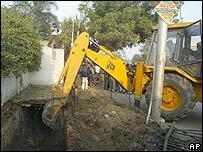 A bulldozer was deployed to dig up earth around the property. The news has shocked and angered parents of the missing children. Police were sent to control crowds who tried to storm the house. "My son went missing eight months ago. Police have not told me anything," one parent told the BBC. "But I am fearing the worst." Many others told the BBC that they had reported missing children in recent months but that the police had done nothing about it.